Edouard Heuer started his watch company in 1860 at St-Imier in Switserland. Since then the brand has set many major milestones of high-end watchmaking, especially in the field of chronographs and ultimate precision. The patent of Heuer’s first chronograph is from 1882! Heuer grows in the first half of the 20th century by building many dashboard timepieces, to be used in cars and airplanes. Later on many stopwatches followed. 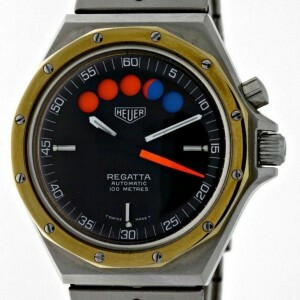 And with the affinity with sports in general, a regatta Yacht Timer for sailing sports couldn’t fail. 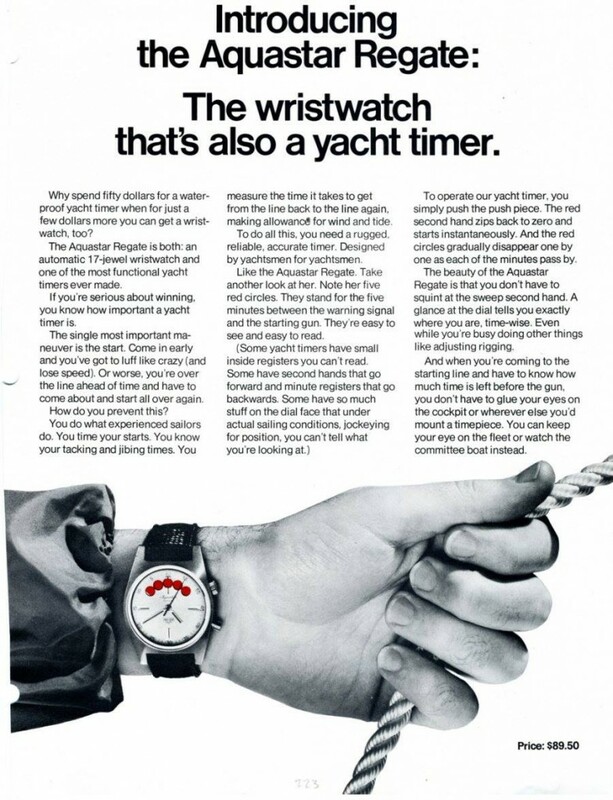 End 1950’s the first models of a Yacht Timer stopwatch worn on the wrist came into sight. 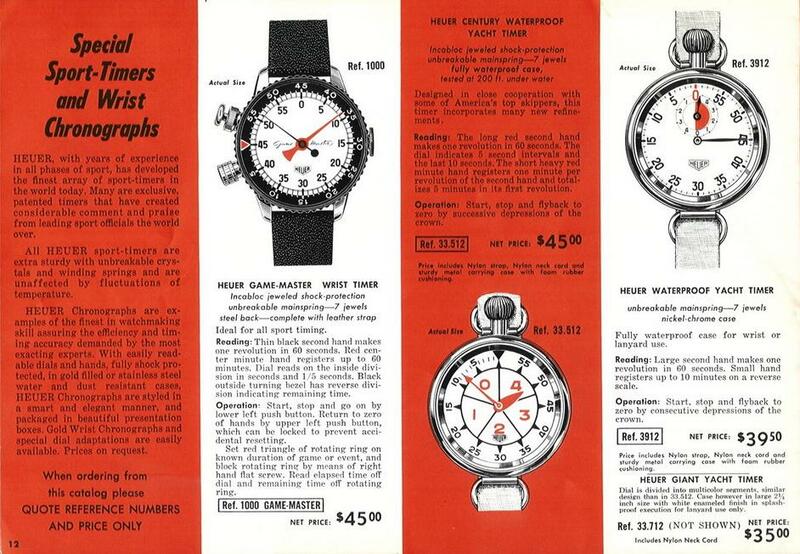 Page from the 1961-62 Heuer catalogue with the Yacht Timer stopwatch worn round the wrist. 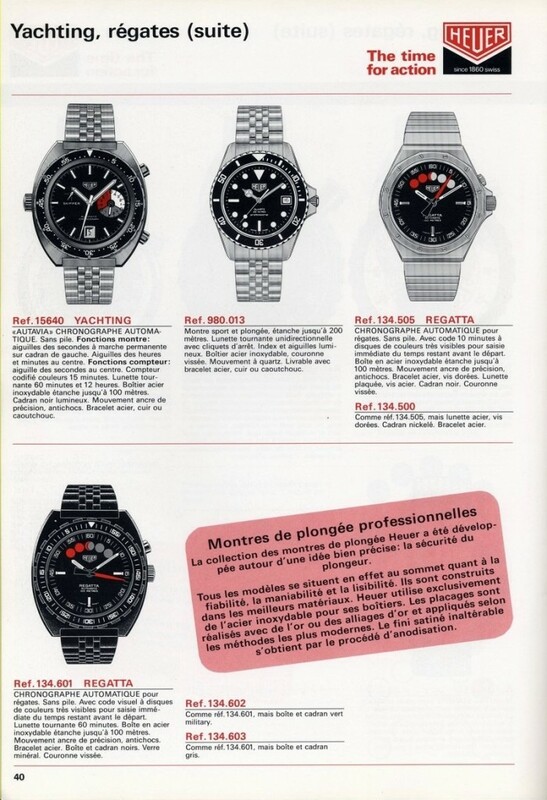 Page from the 1972 Heuer catalogue. You can read a very nice overvieuw of 25 years (1959-1984) of the older Heuer handheld and wrist stopwatches and chronographs compiled by Henrik on his Heuerchrono website, see here, and another one compiled by Jeff Stein on his OnTheDash blog, see here. Heuer’s sailing heritage extends back to the first Heuer Solunar (Solar/Lunar) of the 1940’s that featured the ability to monitor high and low tides, and the Heuer Mareographe (also sold in the USA by Abercrombie & Fitch as the Seafarer) in the 1950’s. 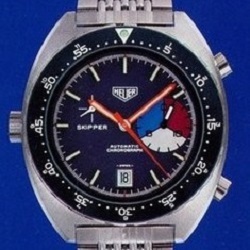 Heuer Solunar and Heuer Mareagraphe. 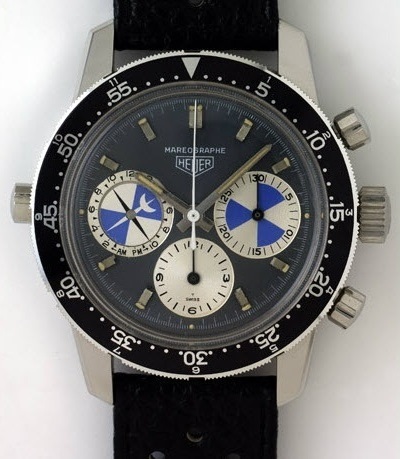 In 1965 Heuer entered a partnership with Aquastar and began to distribute the full line of Aquastar watches, including the Aquastar Regate, the first real regatta yachttimer powered by the Felsa 4000N movement. 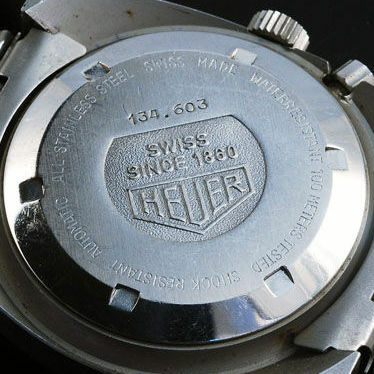 Soon after that, the Heuer logo was added to the dial so the watches were co-branded with both names Aquastar and Heuer. You can read more about the Felsa 4000N movement in the Aquastar 1960’s section here. Heuer’s partnership with sailing teams started in 1967 when Heuer was the official timekeeper of the 12-metre class yacht Intrepid with skipper Emil Mosbacher, which would win the America’s Cup twice in 1967 and 1968. 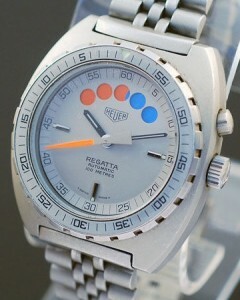 A special version of the Heuer/Aquastar Regate with the name Intrepid added to the dial, was given to the crew members. 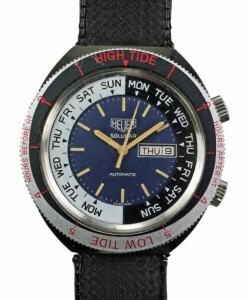 And as a 12-metre class yacht only has a few crew-members, this watch must be pretty rare! It seems the hands of the copy in the picture are non-original and have been replaced. More about the history of Heuer and the 12-metre class yacht Intredpid at Heuerchrono.com website here. 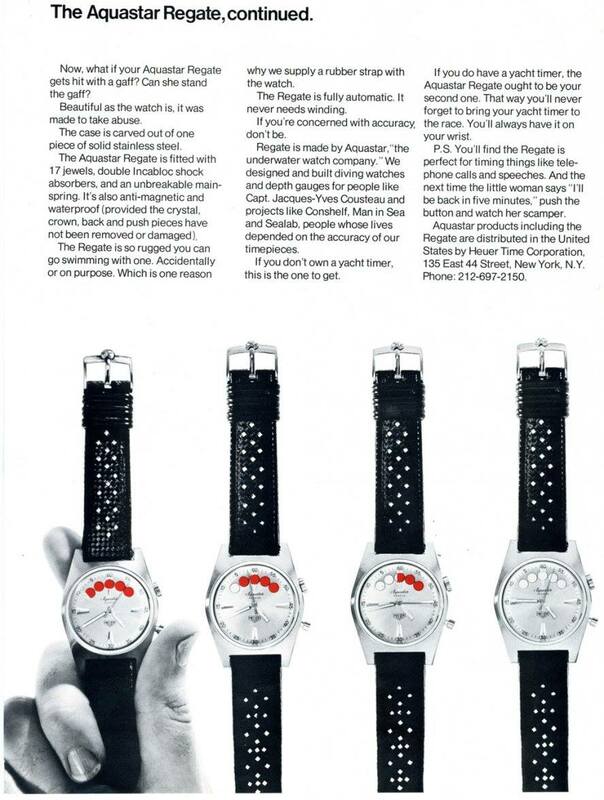 Ad for the Heuer / Aquastar Regate, distributed by Heuer Time Corporation in the USA. 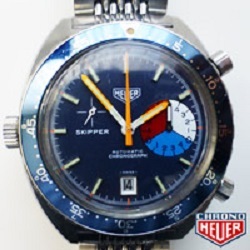 Then in 1968 Heuer introduced their own regatta watch: the Skipper. 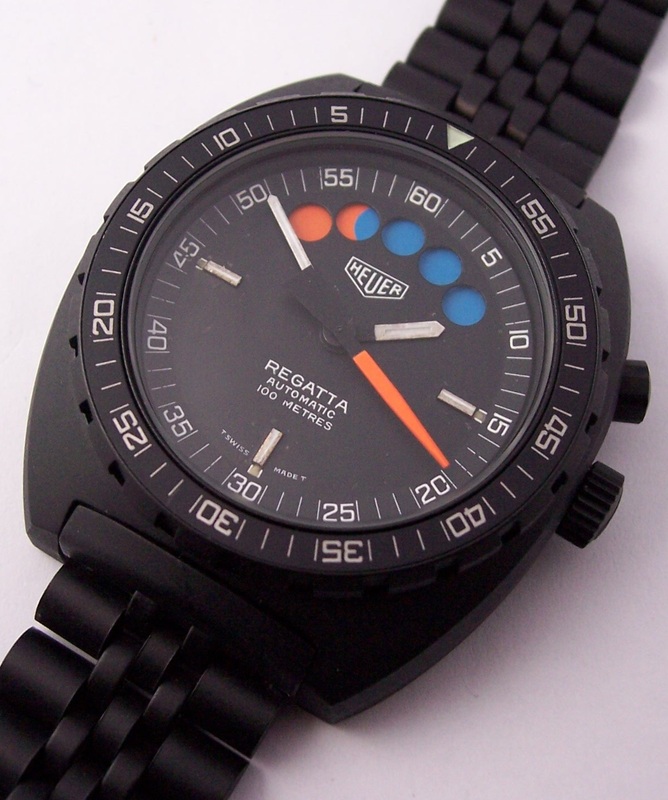 A normal chronograph with the minutes counter in a subdial, divided by colours in 3 times 5 minutes, showing the 15-minute regatta countdown. Until beginning of the 1980’s the Heuer Skipper is made in a variety of different models. At Henrik’s website www.heuerchrono.com there’s this comprehensively overview where the Skippers are divided in 8 different types. The first Skipper was housed in the 1960’s Carrera case with reference 2447, as all later versions were housed in the Autavia case with reference 7763 Compressor case. The first three versions run on a Valjoux 7730 movement, as the other versions have a modified Caliber 15 movement with the crown on the left side and the pushers on the right side. As a low cost alternative Heuer also made a Leonidas version of the Skipper: the Easy-Rider Skipper. Heuer Skipper type 1, 2 and 3. 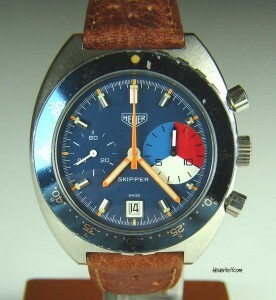 Model: Heuer Skipper – type 1. Reference: Skipper 7754, with the 15 min. subdial in green-green-orange at 3 o’clock. Caliber: manual wound Valjoux 7730 movement. Model: Heuer Skipper – type 2. Reference: Skipper 7764, with an oversized 15 min. subdial in red-white-blue at 3 o’clock. Model: Heuer Skipper – type 3. Reference: Skipper 73464, with an oversized 15 min. subdial in red-white-blue at 3 o’clock, and a date window at 6 o’clock. Caliber: manual wound Valjoux 7733 movement. Heuer Skipper type 4, 5 and 6. 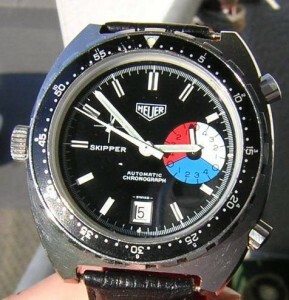 Model: Heuer Skipper – type 4. Reference: Skipper 1564, with the 15 min. subdial in white-blue-red at 3 o’clock, and a date window at 6 o’clock. Caliber: modified Caliber 15 automatic movement. Model: Heuer Skipper – type 5. Reference: Skipper 15640 Blue, with the 15 min. 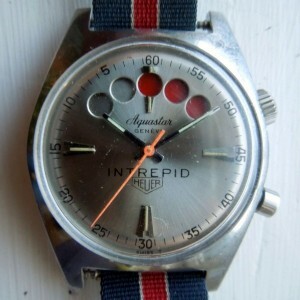 subdial in red-white-blue at 3 o’clock, and a date window at 6 o’clock. Steel bracelet or leather strap. Case size: Ø 42,5 mm / H 15,6 mm. 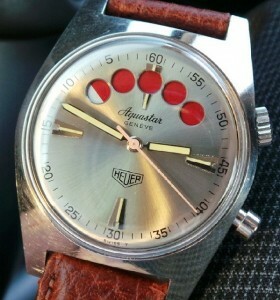 Model: Heuer Skipper – type 6. Reference: Skipper 15640 Black, with the 15 min. subdial in white-blue-red at 3 o’clock, and a date window at 6 o’clock. Steel bracelet or leather strap. Heuer Skipper type 7 and Leonidas Easy-Rider Skipper. 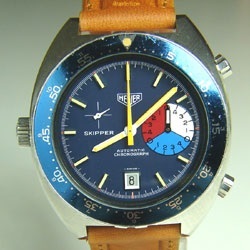 Model: Heuer Skipper – type 7. Reference: Skipper 15640 Black Later, with the 15 min. subdial in white-blue-red at 3 o’clock, and a date window at 6 o’clock. Steel bracelet or leather strap. 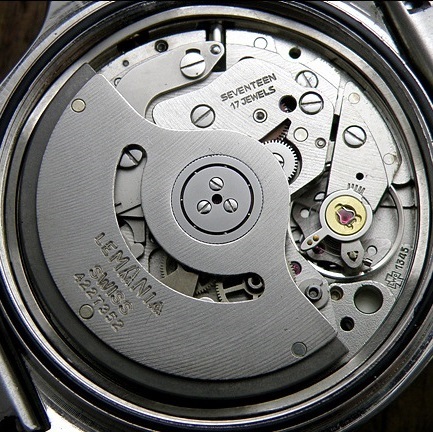 Caliber: automatic modified Caliber 15 movement. Model: Leonidas Easy Rider Skipper. Reference: Easy-Rider Skipper 423.804, with the 15 min. 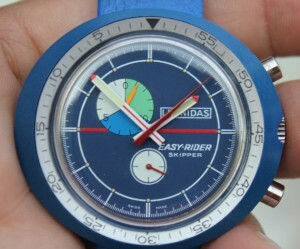 subdial in white-blue-red or green-blue white at 10 o’clock. Caliber: manual wind EB 8420 modified Pin-Pallet from Ebauches Bettlach. Case size : Ø 45 mm / H 13 mm. 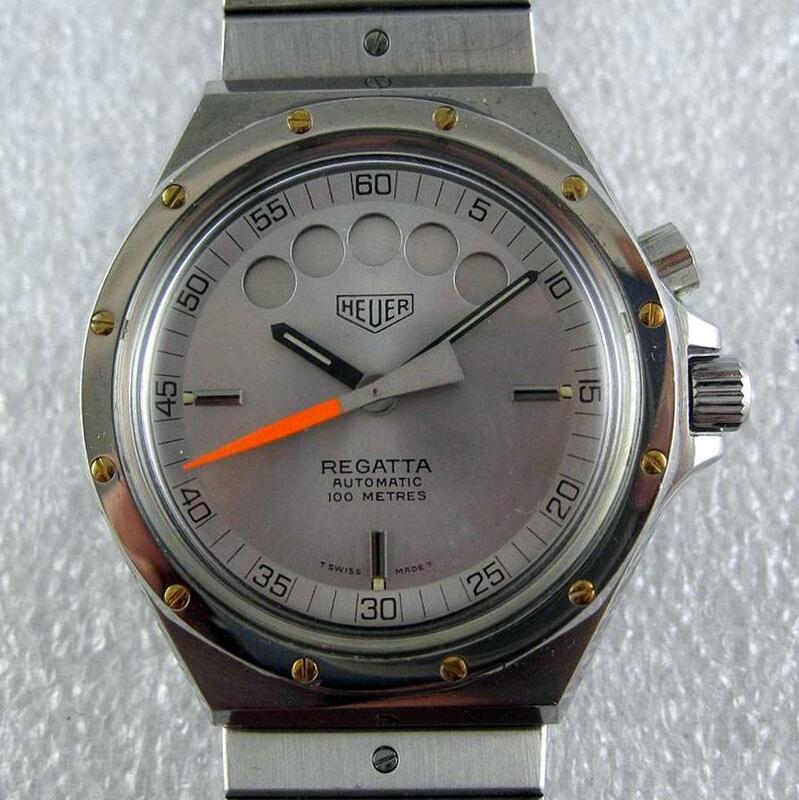 Eventually, in 1983 Heuer began to produce its own regatta chronographs powered by the Lemania 1345 movement, considered to be far superior to the previous Felsa movement. 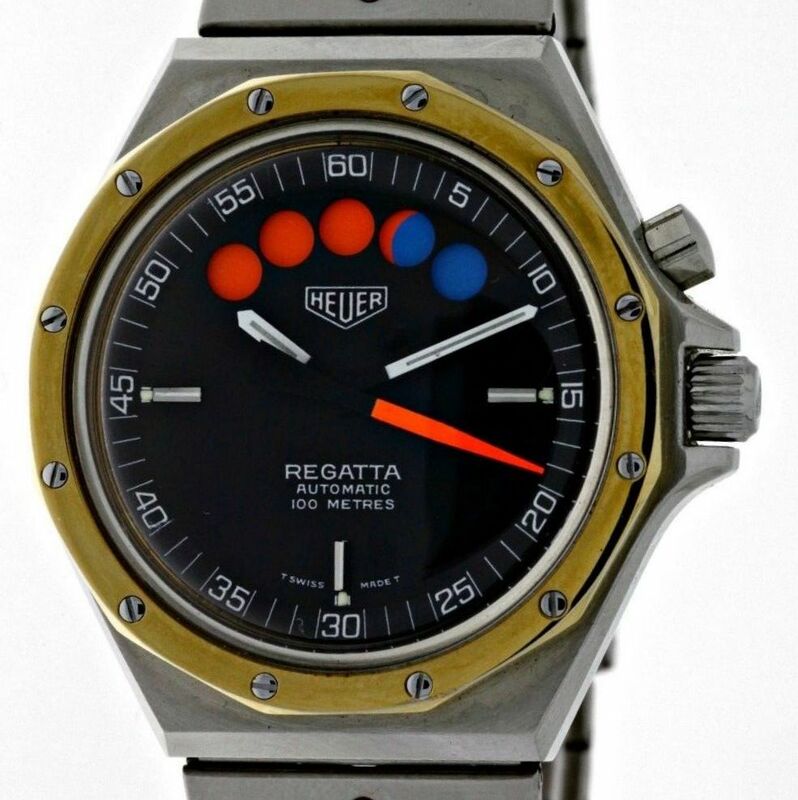 This first true ‘Heuer Regatta’ was produced in two variations. The first model featured a silver dial and a fixed steel bezel with gilt screws and a steel bracelet (134.500), the second model featured a black dial and a fixed gold-plated bezel with steel screws and a steel bracelet wilt gilt screws (135.505). Both bracelets have a tri-fold safety clasp with Heuer logo. 134.500 Heuer Regatta with silver dial 134.505 Heuer Regatta with black dial. 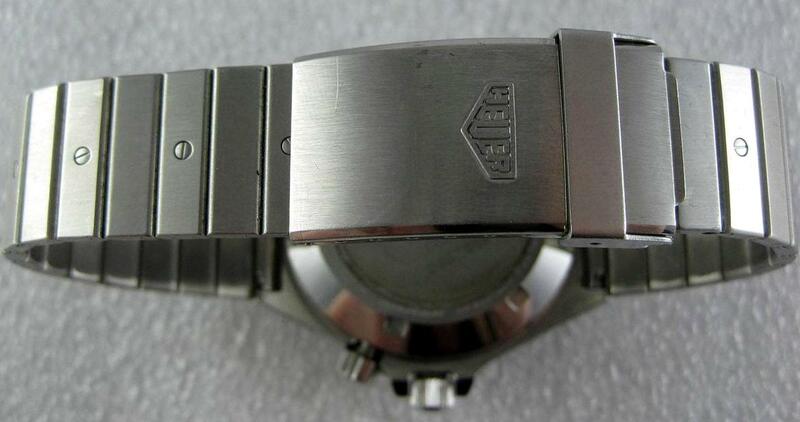 Tri-fold safety clasp with the Heuer logo. Reference: 134.500 with a silver dial and a fixed steel bezel with gilt screws. 134.505 with a black dial and a fixed gold-plated bezel with steel screws. Case size: Ø 40 mm / H 15,8 mm. The cooperation with Aquastar didn’t end, as later on Aquastar is selling this model as their Regate Newport, with just the Aquastar name and logo on the dial. 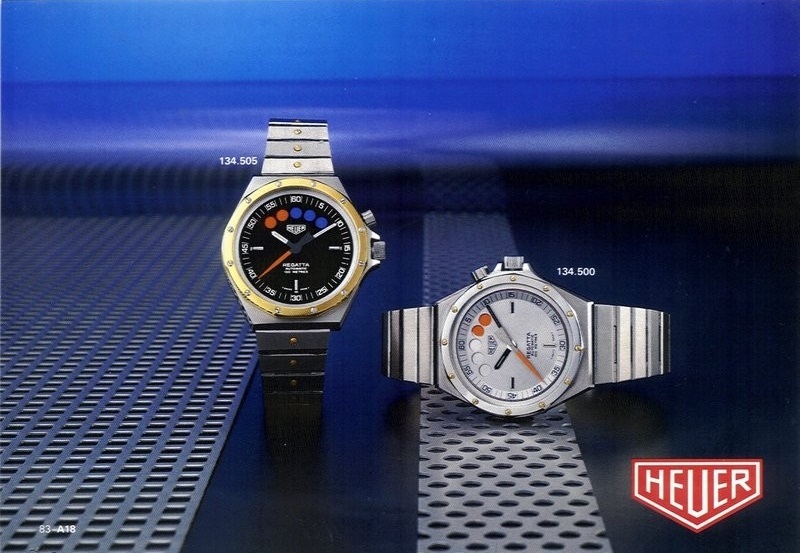 Page 35 from the Heuer 1983 Time for Action catalogue. 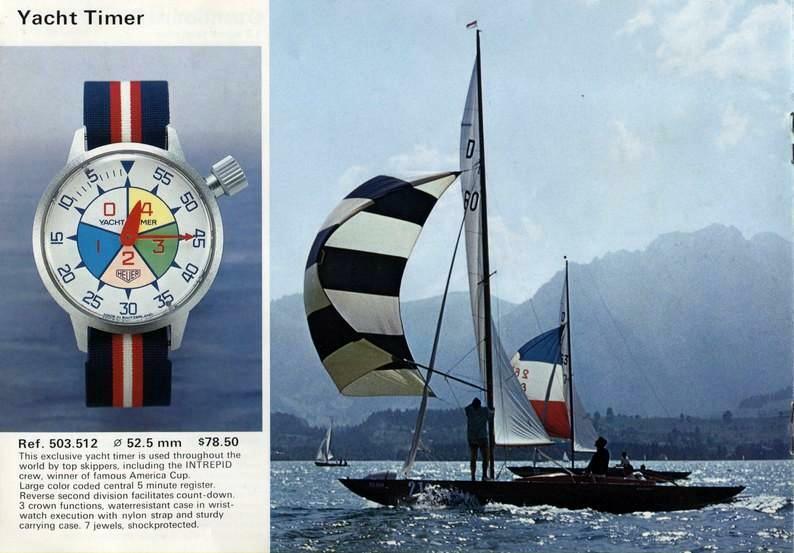 In 1983 Heuer also introduces the 600 Series Regatta, with a more sporty and rugged design. 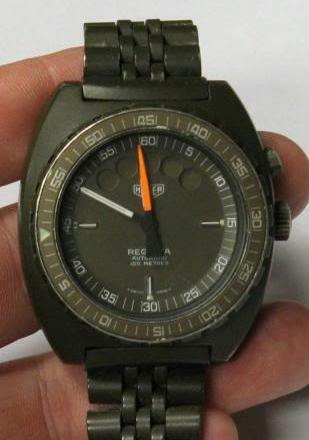 For this watch Heuer used an Autavia-style case that could be bought with a PVD finish in three different colours: black, olive (military green) and pewter (grey). It had a matching PVD stainless steel bracelet with a tri-fold safety clasp. The 600 Series Regatta continued to use the Lemania 1345 movement with the coloured indicator disk for the countdown chronograph. 134.601 in PVD black 134.602 in PVD green 134.603 in PVD grey. Tri-fold safety clasp, slightly different, with the Heuer logo. Reference: 134.601 with black PVD coating. 134.602 with military green PVD coating. 134.603 met grey PVD coating. Caliber: automatic Lemania 1345 movement. Case size: Ø 42 mm / H 16,4 mm. The countdown in progress is nicely visualized by Stewart Morley at his website Heuerville.wordpress.com. With a perfect series of photos you can clearly see how the colours change from all blue at the 10 minutes gunshot, to orange at the 5 minutes gunshot, and finally to black at the start of the regatta. See here. And you’ll find an interesting section about the ‘5-dot Heuers’ on the Heuerchrono webite, see here. 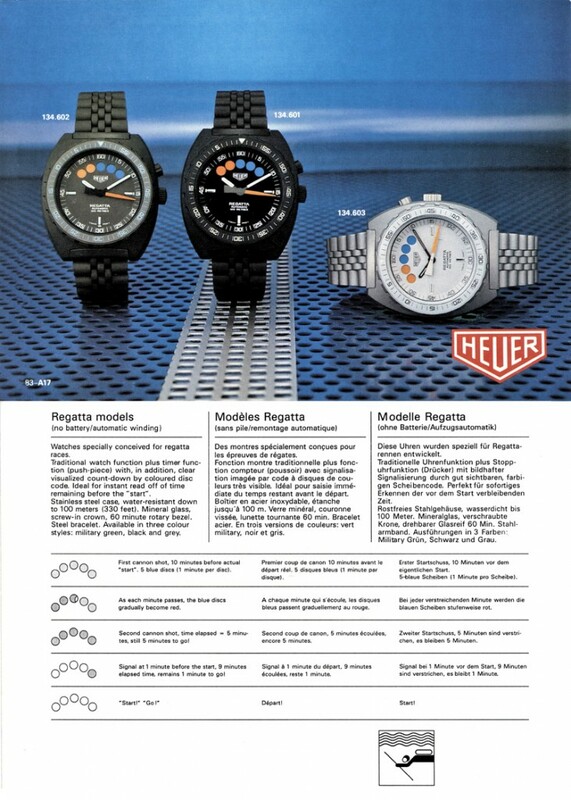 Pages from various 1983 Heuer catalogues. Unlike the Aquastar, the Tissot and the Lemania versions of the regatta watches with the Lemania 1345 movement, with both the 134.50X and 134.60X series Heuer does not count the seconds backwards from 60 to zero but forward from zero to 60. See the above dials. 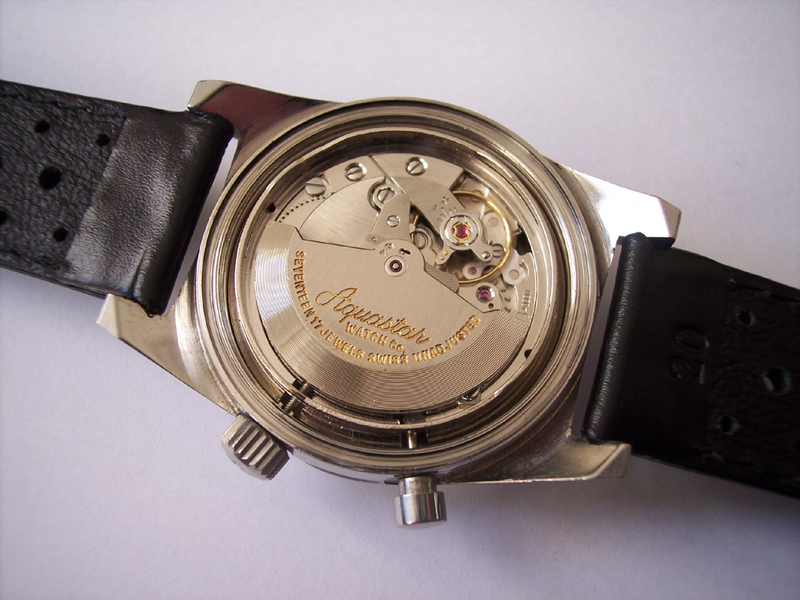 The rotor of the movement is marked Lemania instead of Heuer (or Aquastar). The casebacks though, are made by Heuer with an engraved reference number. For a complete description of the Lemania caliber 1345 go to the Aquastar 1970/1980’s section here. 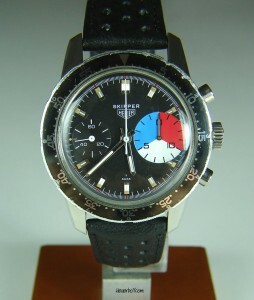 Beginning of the 1980’s the quartz crisis requires its toll by Heuer, and Jack W. Heuer (great-grandson of Edouard Heuer) is forced to sell the company in 1984 to the Arab TAG (Techniques d’Avant Garde). 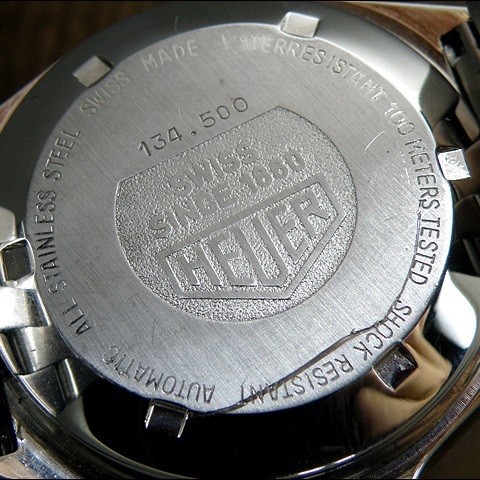 Lateron the company was renamed into TAG Heuer S.A. More about TAG Heuer’s history here. 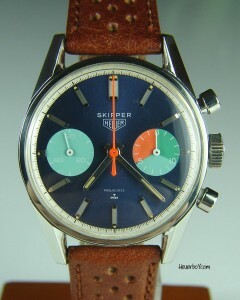 Many thanks to Henrik (HeuerChrono) for helping me with the Heuer Skipper models.